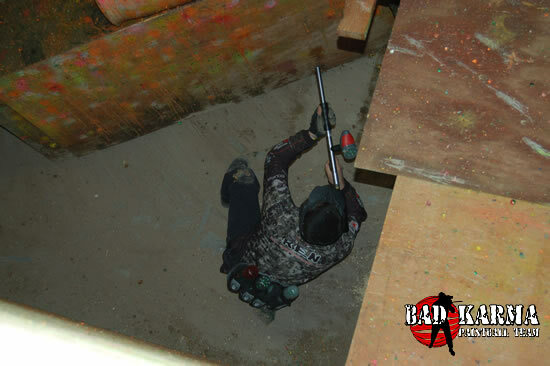 Bad Karma was proud to host one of the first competitive paintball events of 2010. 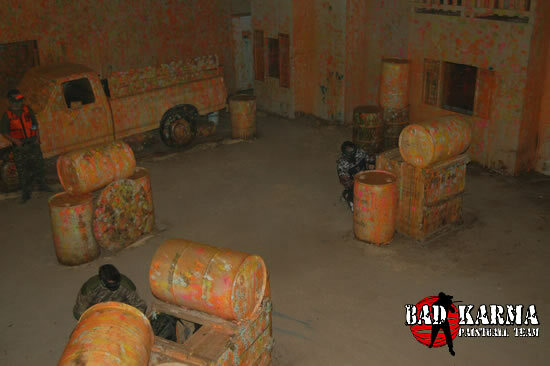 On January 30th, Bad Karma and Addiction Paintball invited teams to come to a 5-man CQB (close quarters battle) tournament. 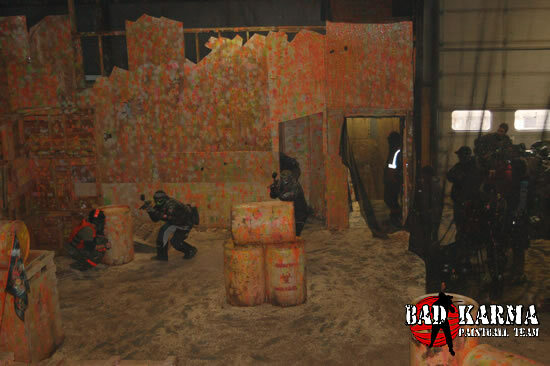 Held at Addiction Paintball's urban field, the event brought in teams from Utah, Wyoming and Nevada to participate in a double elimination format. "It's really really a fun field. It's pretty balanced... It's really intense to play because you have enough corners to make it uncomfortable to move anywhere." Field: The Addiction Paintball field is one of the newest in Utah and features a two-level CQB playing field dotted with obstacles, shooting lanes, hallways and even a pickup truck. Newly completed, both the north and south sides of the field have ways to get to the second level, which adds another dimension of playing opportunities. You can get the drop on someone from up high, backdoor teams that only secure one level, and execute detailed game plans because of the well thought out field construction. Teams were divided into two divisions based on how long they've been established and their participation in tournament level events. A dozen teams total competed, with four in the "Recruit" division and eight in the "Veteran" division. "It feels good to come into a competitive type of setting and just know that the guys you're playing against are going to play straight up honorable ball." "The big thing that's really important to me is sportsmanship. That has been great here. I didn't hear a single complaint all day... The example was set by the other veteran SPPL teams which was awesome." Tippmann X7 paintball markers were awarded to the recipients of both the Sportsmanship Award and the MVP award for the tournament. Sportsmanship: Kunia Burnett of Skeleton Warriors. Kunia had a great surrender coming around a blind corner. He could have lit up his opponent, but instead got the surrender. MVP: Josh Durbano of Smash Brothers. Josh barrel tagged an opponent coming out of the dark hallway after advancing the entire field. At the end of the Tournament, the winners of the Recruit bracket, Smash Brothers, challenged the Veteran champs, Special Ops Paintball, to a game. One player from Special Ops came over to the Smash Brothers for a great 6-on-6 showing. The young guns managed to come out victorious in the friendly match. "The field is incredibly crazy. There's not a real sweet spot on it so there's a lot of movement. It's totally different than what I'm used to." Bad Karma would like to thank event sponsors Tippmann, Special Ops Paintball, Elite Weekend Productions, the SPPL and EVO Energy for their contributions. Thanks to Desert Edge for a huge showing. Thanks to Team Supressor, Skeleton Warriors and Southern Scabs for traveling a great distance to come to the tournament. Also, thanks to Addiction Paintball for hosting the event. Finally, thanks to every player who supported the event. We hope you had a great time playing. 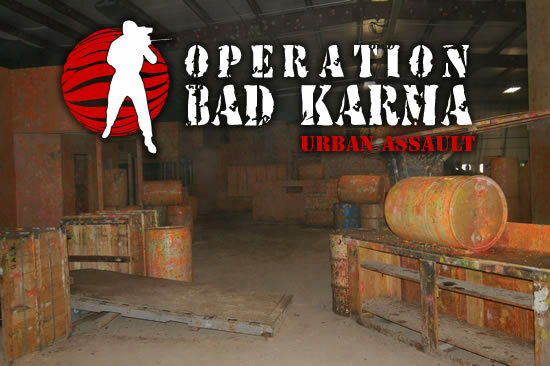 We look forward to future events at this venue and are making plans to have Operation Bad Karma: Urban Assault be an annual tournament.